Bumblebees can avoid recently depleted flowers by responding to repellent scent-marks deposited on flower corollas by previous visitors. It has previously been suggested that avoidance of visited flowers for a fixed period would be a poor strategy, since different plant species vary greatly in the rate at which they replenish floral rewards. 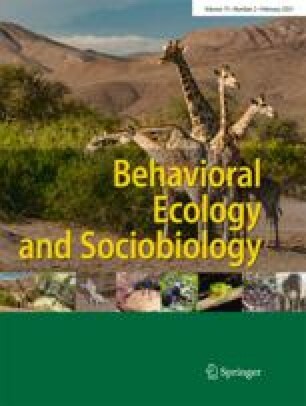 In this study, we examined the duration of flower repellency after an initial bumblebee visit, using wild bumblebees (Bombus lapidarius, B. pascuorum and B. terrestris) foraging on four different plant species (Lotus corniculatus, Melilotus officinalis, Phacelia tanacetifolia and Symphytum officinale). We constructed a model to predict flower visitation following an initial visit, based on the nectar secretion pattern of the different plant species, the insect visitation rate per flower, and the search and handling times of bumblebees foraging on the plant species in question. The model predicts an optimal duration of flower avoidance which maximises the rate of reward acquisition for all bees. However, this optimum may be open to cheating. For two plant species, the evolutionary stable strategy (ESS) is a shorter duration of flower avoidance than the optimum. We found the duration of flower avoidance was markedly different among flower species and was inversely related to nectar secretion rates. The predicted ESSs for each plant species were close to those observed, suggesting that the key parameters influencing bumblebee behaviour are those included in the model. We discuss how bees may alter the duration of their response to repellent scents, and other factors that affect flower re-visitation.